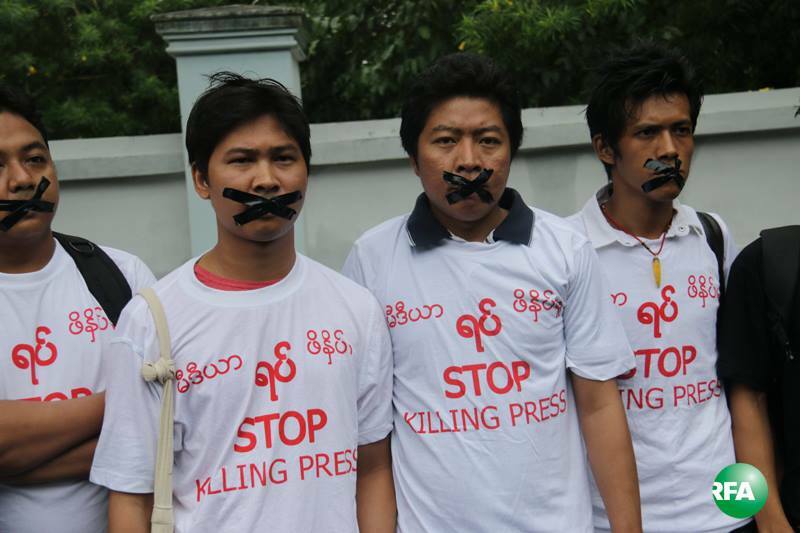 Four Burmese journalists and the CEO of the Unity Journal were sentenced to 10 years imprisonment with hard labour on July 10, 2014 for violating a colonial era secrecy law in Myanmar. Unity Journal's CEO Tin Hsan, 52, and journalists Lu Maw Naing, 28, Sithu Soe, 22, The Yazar Oo, 28, and Aung Thura, 25 were found guilty of violating the State Secrets Act after they published a story revealing a hidden chemical weapons factory in central Myanmar last January. The case of the Unity journalists has received national and even global attention. Protest actions were organized by journalists in major cities including Yangon and Mandalay. Supporters and free press advocates have also conducted prayer events in Yangon, Pathein and Sittwe for the release of the Unity journalists. Unfortunately, 50 journalists who protested during President Thein Sein’s visit to the Myanmar Peace Center on July 13 have been charged for protesting without permission. Various press associations and interim press councils are planning to send an appeal letter to the president for the release of the Unity journalists. The opposition National League for Democracy has also released a statement condemning the government's suppression of the media. Burma News International warned that media freedom is still under threat. The government is claiming that the chemical weapons factory reported by Unity Journal is actually a defense weapon factory. If they are convicted for revealing national secrets, it means the government actually has the chemical weapons factory. So they (government) are breaking the Southeast Asian treaty against Weapons of Mass Destruction, which puts a restriction on the production of chemical, bio and nuclear weapons. Also, Myanmar has signed the Chemical Weapons Convention in 1993. Any nation, any government, must control secret issues for their national security. Information that harms national security is not even tolerated in the United States. We don’t think this case is about press freedom. Many prominent writers and journalists in Myanmar have expressed concern about the harsh punishment given to the journalists. The poet Saw Wai thinks that it is not fair especially since the country is moving towards the path of democracy. U Than Htay from the Myanmar Journalists Network believes that the conviction is an example of media intimidation by the government which is preparing for the coming 2015 elections. When their secrets are revealed, they arrest and charge people. Media is always the scapegoat. Democracy is only just a show. The president is no different. Actually our country is still under military dictatorship. If government is (serious in) moving towards democracy, then it should respect press freedom. There must be transparency. Reporter's job is to write. The punishment must be fair in relation to the violation. It wasn't even a secret or restricted area. The government has been aggressive in the past year in prosecuting journalists. Last December, a local reporter from Eleven Media was sentenced to three months in jail for trespassing, criminal defamation and using obscene language. Last April, a correspondent from the alternative site Democratic Voice of Burma was handed out a one year prison term for trespassing and disturbing a civil servant. Later that month, a reporter for Mizzima magazine was arrested for organising a rally in the town of Pyay to call for the release of six journalists currently imprisoned in Myanmar. The case of Unity Journal should remind us about the continuing detention of journalists and the worsening media repression in Myanmar. So who built that chemical weapons factory in Burma? There are only two possibilities. The Chinese or the North Koreans? What? You think it’s a Japanese chemical weapons factory? I don’t think so. Great article. Are there renewed crackdowns on activists working on other rights issues as well, as under military rule, or are journalists the primary targets? Have people been arrested for social media activities?